Broadcasting Live in 2002Dave's radio studio has come a long way in 10 years! 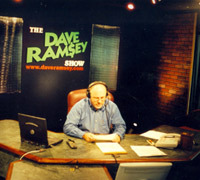 This photo from 2002 shows Dave in one of the first studios at the current location. There's Dave's big desk, the high-res screen behind him, cameras, lighting and a control room that looks capable of launching a satellite into space. But the studio hasn't always been that impressive. In fact, early versions of The Dave Ramsey Show studios were makeshift, thrown together, do-it-yourself projects. "Our first studio, way back before Blake was the producer, was on Music Row with WTN. That was a decent studio," Dave said. "Then we moved to the top of a building that is now the Hutton Hotel in Nashville. It was pretty ragged then. We had antiquated equipment, but it worked." Later, the show's studios moved out to the Opryland Hotel. That's when Dave's long-time producer, Blake Thompson, started working. "The studio was a small office with a table and a piece of plexiglas dividing where Dave sat and where I was running the board and answering the phones," Blake said. "I would have to talk really low when someone would call in on the show, because Dave was literally eight feet away from me." "We were always ordering Domino's pizza," Dave said. "They would deliver it during the first commercial break, and when we came back live we would try and not burp during the whole segment after that." Eventually, the show moved studios from Opryland to Brentwood, closer to Dave's office today. Their first Brentwood studio, like the previous one at Opryland, was a do-it-yourself job. "We got an old round 36-inch table from the scratch and dent section in the back corner of Staples," Dave said. "It had nicks all over it. We drilled holes in it and stuck those microphone holders in the holes. We put the soundproofing stuff on the wall, but it didn't work." "There were three of us in the control room," said Lara Johnson, assistant producer for The Dave Ramsey Show. "Blake, myself and our engineer at the time. I was practically sitting on Blake's lap!" "We painted the walls purple for some crazy reason," Blake said. "But we paid cash for that studio, like the other ones we've bought, so we were happy about that." 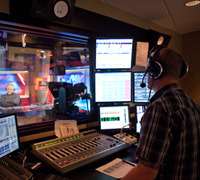 Behind the Scenes of a Live Radio Show Producer Blake Thompson at work in the control booth while Dave is on the other side of the glass talking with callers. When the show moved to its current location 10 years ago, Dave, Blake and team finally had something worth staying in for a long time. Though the current studio has been through several remodels and updates, the show hasn't moved in quite a while. "This really is our dream studio," Blake said. "One time we got new chairs for the studio and control room. Dave was just figuring out his new chair and hadn't adjusted it yet," Lara said. "We were halfway through the first hour when Dave pushed a button to adjust the height on his chair, and suddenly he disappeared beneath his desk! We lost it in the control room. Then, right after that, we hit the same button on our chair and dropped below the counter in our room. That's when Dave totally lost it!" she said. Up until several years ago, visitors could actually sit inside the studio and watch the show live. But after the installation of some high-tech cameras, the studio ran out of space. That's when Dave's vision for Martha's Place began to take form. The studio now features a large glass window where visitors to Dave's office at Financial Peace Plaza can watch the show live from the lobby. Guests can sit in plush chairs just outside the glass and watch the show while the audio is piped into the lobby. Or they can take a few steps to Martha's Place and enjoy a cookie and a cup of coffee while they watch the show. An Interactive Experience A couple does their debt-free call from the studio lobby while other guests look on. In just the few years that Martha has worked for Dave, she's quickly become one of the most popular people in the building. Some people probably visit the studio more for Martha's cookies than Dave's show. But don't tell Dave that. Though the studio has changed many times over the years, Lara said she's proud that the quality of The Dave Ramsey Show has always been consistent. "It's truly been an honor to work with these guys for so long. I'm excited to watch the show keep growing and impacting more lives." 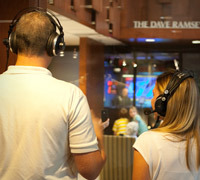 Have you visited The Dave Ramsey Show to watch Dave broadcast live from one of his studios? Tell us about your memorable experiences in the comment section below.